So gorgeous in green! Great card NanaConnie and sounds like a great technique as well! Hope you're well....have a lovely weekend! Do I see green again!!!! VERY cute and pretty. Love that image and you've framed her out to perfection. Fantastic card and a wonderful image. Love the frame around her. Love how you applied the velvet glitters (they are my favorites and feel so smooth) too. So glad you shared this for the Sparkle N Sprinkle Creative Challenge too! Must say I love this card,beautiful background and delightful image!! Very pretty, great inspiration for our "use green" challenge at Open-Minded Challenge this fortnight. I wonder how many of us do have a bit of the blarney in us, I know I do. lol. Another lovely card. Love the green newspaper and the pearls. Cute image too. Loooove this great image and how you have colored it up. Fabulous embellishments as well!!! Great looking card! Love all the green and the sweet image. Thanks for "making it digital" and playing with us this week over at PFP. Hi, I am back, this time to thank you for joining us at lexi's Creations with this fabulous card! Oops, guess I was already a follower & didn't realize it! Will be back to enjoy your work! Stunning card with fab coloring and lovely sparkling....thanks for playing with us at Divas by Design! A gorgeous card, I love your design and great background. Your image is adorable and lovely detailing!! This is gorgeous and perfect for our make it sparkle challenge at Diva's by Design. What a sweet card! I love the image and all the sparkle! Thanks for joining the Sparkle N Sprinkle challenge. 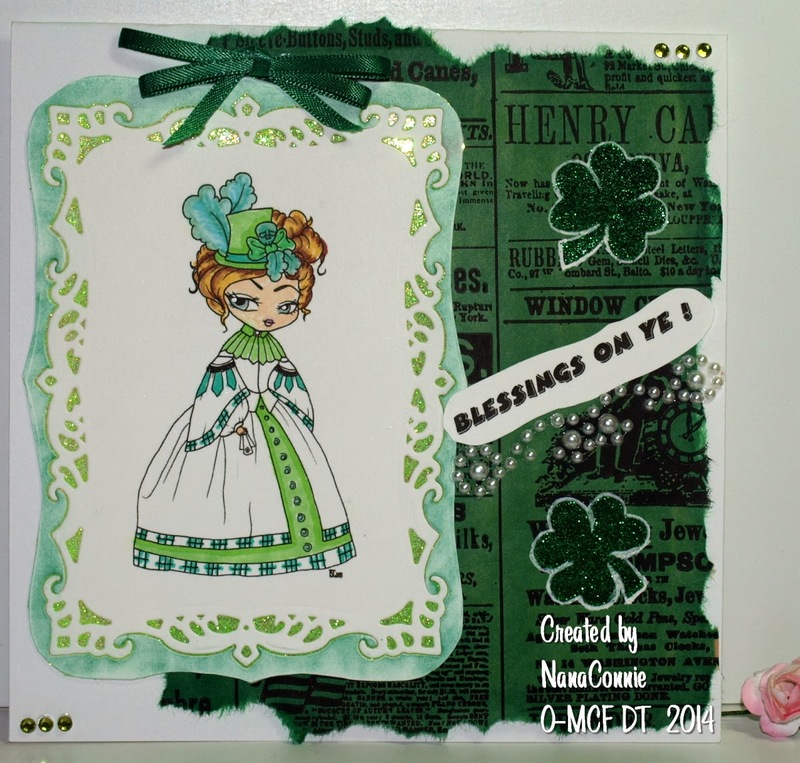 Great "green card" Connie - and a wonderful technique for using the negative portion of your die cut! Love your darling little lass, too - such pretty colors of green and wonderful coloring! Now to put on my other hat. Thank you for joining us at Sparkle N Sprinkle this month! I hope you will submit more of your pretty cards to the challenge in the future! Cute card, love the greens. Thanks for joining us at Perfectly Rustics.